masterpiece in progress: "Shukran" means "Thank you"
Ever since July, when I had a polio booster shot, I have been unwell. It is unclear what has caused all my ailments, but the last problem was a combination of sinusitis and bronchitis. Backtrack to June of this year. On a whim, wanting to do something with my husband that he would truly enjoy, I suggested that we go to the exhibition of King Tutanchamun replicas in Cologne. We went, were astonished at the beauty and sophistication displayed by the people of this period, and wanted more. We booked a trip to Egypt, leaving in October. By the time the date of departure approached, I was hoping for more than a glimpse of golden treasures in the Egyptian Museum in Cairo - I was longing for healing. I received it in ways I had never dreamed of. Since this blog has to do with personal development as well as the experience of living abroad and traveling, I thought it would be appropriate to put my Egyptian experience in blog form. 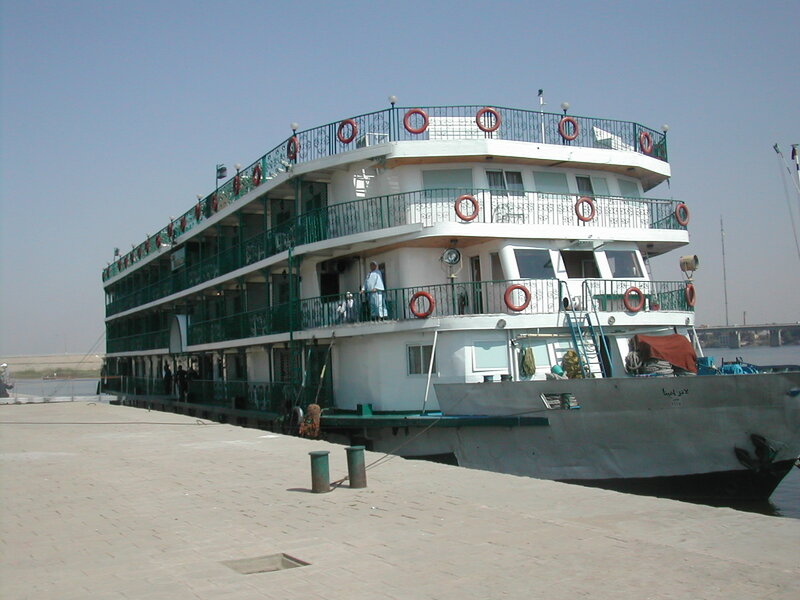 This will be a series of blog entries about the week Peter and I spent in Egypt. Frankfurt airport. My head is full and I'm coughing up a storm, trying to get this day's worth of pflegm out. Will I ever get well? Am I crazy to go to Egypt when I'm still sick? My doctor thinks not. She says, "All that heat and dry air will dry your sinuses right up." I'm on my fourteenth day of antibiotics, the fourth round since July. "Be sure to use a netipot," a friend reminds me. I promise that I will. Anything to get better. In my nervousness, I gnaw at my fingernail. Uh-oh, I forgot my nail file. Can I find one in the airport? I find one in an all-purpose shop someone at "Information" directed to. A Pakistani male finds a nail file for me immediately. I feel, I'm not really in Germany anymore. No, I'm on an island called "airport". Soon I will be on a flying ship, and then where will I be? Will I be safe? Will I get sicker? Peter and I are joining thirteen other German tourists who will be taking part in what is known as a "Studienreise", something I have no have no knowledge of outside of Germany. Do Americans have this? I haven't a clue. One of the best traits of Germans, I think, is their hunger for culture. There are so many Germans who want to know more about history, art and music, several organizations have been founded to aid them in their pursuit. We have joined a travel agency dedicated to helping German speakers delve into the history, culture and intellectual life of various countries by offering guided study tours. Will my German be up to the challange? Will I like my fellow travelers? I love my group of senior citizen English students, who are also keenly interested in culture. But then there are others I have experienced- unfriendly, arrogant, cold, difficult people. What will we encounter? After a few hours' layover in Cairo, where we find an ultra-modern airport in gleaming granite, but only one coffee shop for all the domestic connecting passengers, we land in Luxor, a tiny little airport in the middle of Egypt. We are met by a travel agent and whisk off minutes later in a van towards our boat. Ten minutes later we are on board my first cruise boat. It is after 12:30 a.m by now, but no matter. We are awake, alert again. 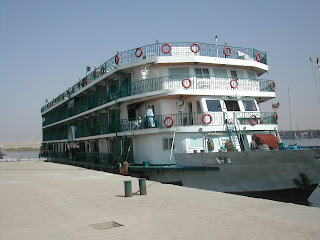 "Welcome to Egypt", we hear, again and again in varying male voices, men all standing at correct, polite attention as we take our seats in the sumptuous lobby of our boat. "Welcome to Egypt", says Mohammed, our tour group leader, and serves each of us a cup of bright red hibiscus tea, the national welcome tea of Egypt. By the time we finish our tea, it is well past 1 o'clock. Time for bed. We are taken to our rooms. Our room is on the third floor. We find a large room with twin beds. It looks just like an elegant hotel room! The sheets are soft, thick Egyptian cotton. We have a marble table and two rattan easy chairs, a vanity, a plasma TV, and a tiled bathroom! The only thing reminding us that we are on a boat is the constant drone of the motor, and the unpleasant stench of fuel. We drop off to sleep immediately, exhausted. Sounds like a wonderful and interesting trip!! !